Take a little time to enjoy the lighter side of life with Dr. Mark Brenner and comedian Mark Schiff. Listen to a fresh, very funny and insightful way to examine life in a different way. Brenner & Schiff. Once a day with meals. 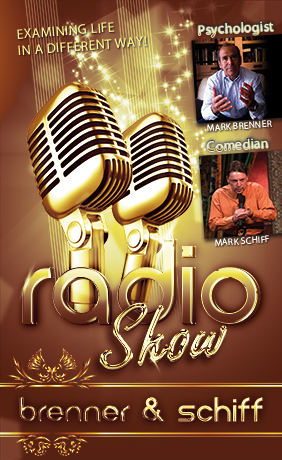 If you would like to sponsor our radio show, contact Dr. Brenner directly at (818) 986-2500. Mark Schiff is one of Americas greatest comedians who’s routines about family, marriage, and relationships makes us see ourselves as only he can. Mark has headlined in all the major casinos and clubs across the country and has appeared many times on both The Tonight Show with Jay Leno, and Late Night with David Letterman. He has had both HBO and Showtime specials, and has been the featured act at the Montreal Comedy Festival. Mark has written for, and guest starred, on Mad About You, as well appearing on Empty Nest, and serving as a writer on The Roseanne Show. Mark has been touring with Jerry Seinfeld for the past seven years. DEMO REEL - click here to listen!